Welcome to the official Wayzata Lacrosse Association home on the web! Here, you'll be able to get news, information, schedules, rosters, game results, directions and much much more. Check back frequently for the latest information about Wayzata Lacrosse. To register, click on the Register Online button located on the left. Please note: If your players US lacrosse number expires anytime before the end of the current season, you will be asked to renew their registration with US lacrosse before you can proceed with registering for a Wayzata lacrosse program! Girl's 10U / 12U / 14U Summer Lacrosse Registration Open! Still looking for more 8U boys for spring! Boy's 8U / 10U / 12U / 14U Summer Lacrosse Registration Now Open! For parents who are buying new helmets, we are asking that you purchase "Athletic Gold" helmets with white visor and chin strap protector. 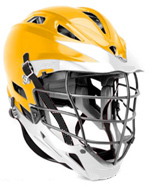 Athletic Gold helmets with white visor and chin strap protector are required at the 14U-A and 12U-A levels. Under no circumstances should a Wayzata player wear a helmet from another association or travel team while playing in games for Wayzata Lacrosse.